Do you know there is a Japanese traditional sweets shop called “Shofukudo” which is located 7 minutes away from Fuse station? It is not at the Fuse shopping street, so you might don’t know about it. This time, I am going to introduce about Shofukudo! 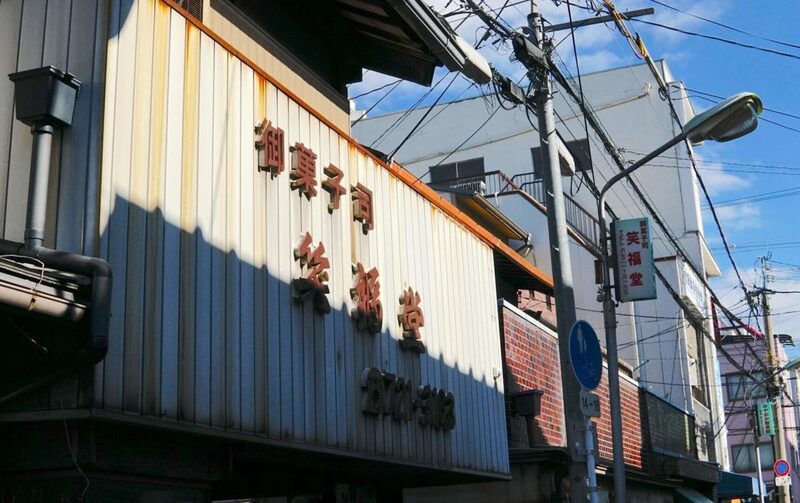 Shofukudo has established in 1903, which is during the Meiji era. That means it has been 116 years since Shofukudo has strated. It is literally an old-established shop. Actually, it was not “Shofukudo” when they started their business. “Yakko mochi” was the previous name of Shofukudo. By the way, “笑福堂”is written like this in kanji. “笑”means smile, and “福” means luck. People who have known about Shofukudo called “Emifuku-san” from different ways of reading kanji. The forth generation of shopkeeper, whose name is Mr. Dekura, is a little shy. 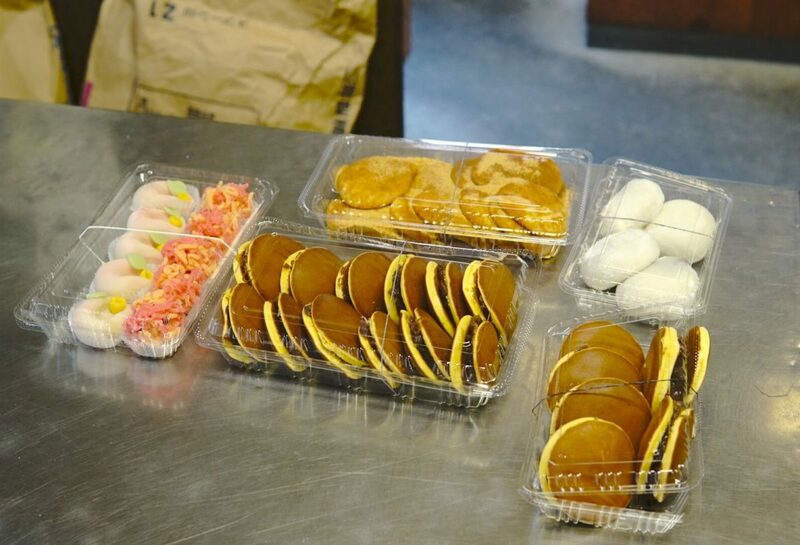 However, when one of the staffs visit the shop, he always show us around his sweets factory and how to make Japanese sweets. He is such a nice and kind person. Can you guess what is this machine? This is a machine for pounding mochi! It was used to use long time ago, so it’s not used anymore. He got highly efficient machine now. You can see the machine’s heavy feeling from the picture, right? I have been to Japanese sweets shop for buying, but I have never get into the factory before. I was so impressed by this machine’s wonderfulness and oldness. So many wood tools! 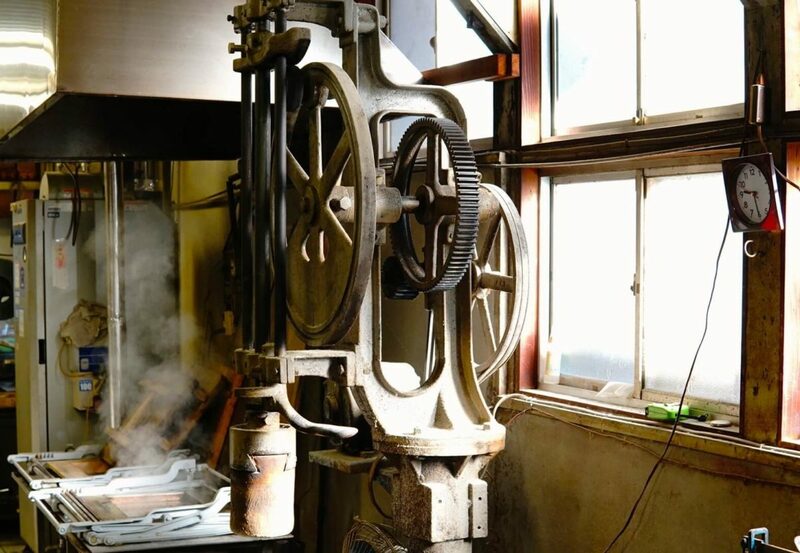 These tools are for shaping small parts of confectionery. There are at least 50 kinds of tools in the picture. Surprisingly, he told that there are about 100 kinds in total. 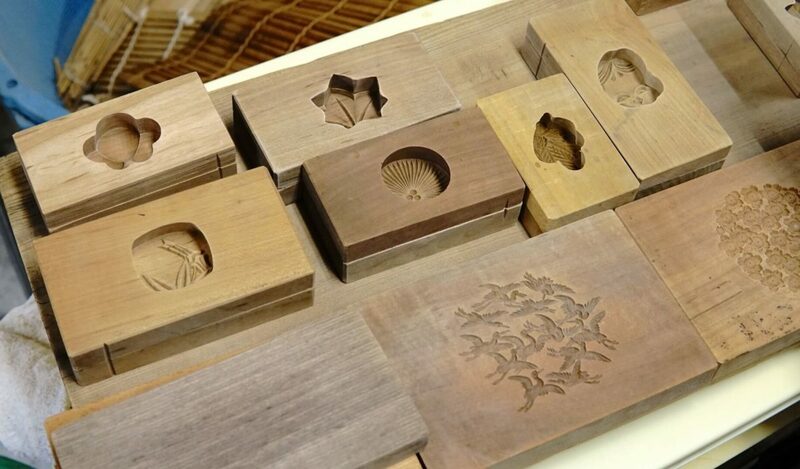 These wood tools are necessary for making Japanese sweets which needs technique. 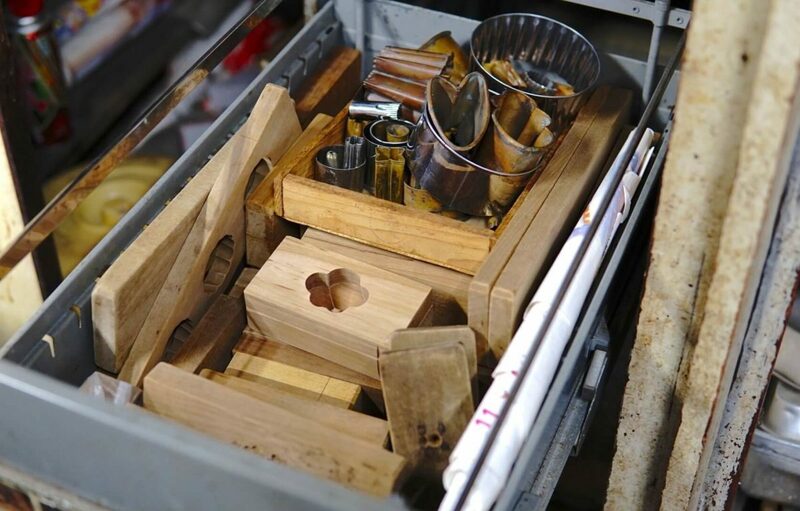 Each tools are selected by the shopkeeper’s passion. 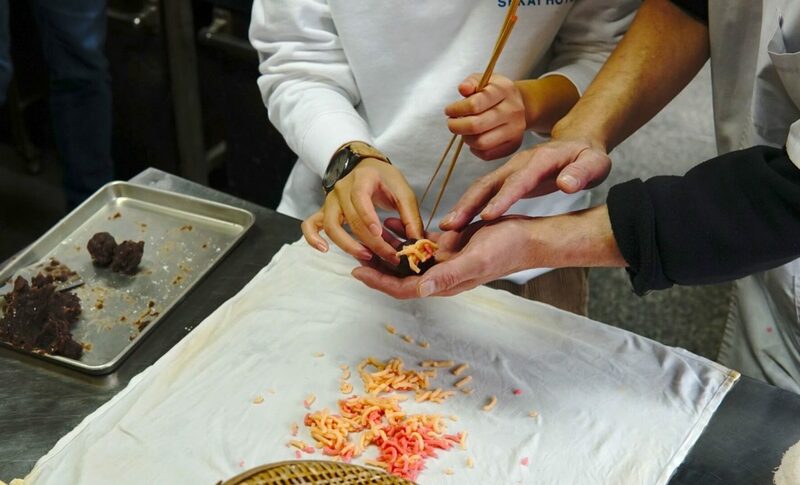 On this interviewing day, we, SEKAI HOTEL staff, experienced how to make Japanese sweets! (This actuvity is only available for SEKAI HOTEL guests!) It was actually the first time for us, so we were excited. Let’s try to make confectioneries! 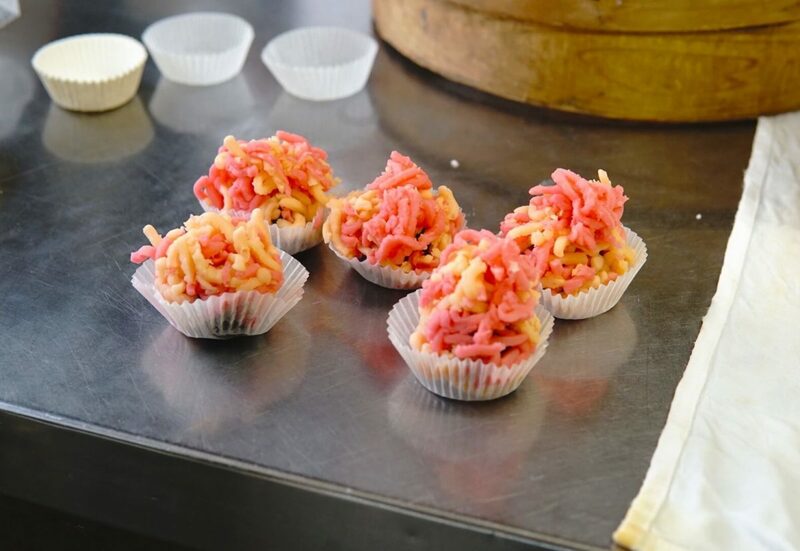 First, make small parts of decoration with colored red bean paste. Then decorate it with thin chopsticks. The shopkeeper makes as if it is so easy, but using this thin chopstick was hard too. After trial and error, we finally made our masterpieces! By the way, the left one in the front line was made by the shopkeeper. You can see the perfect colors and shape. Every time I see his work, I get impressed for his traditional technique. Since I got this chance to interview him, I asked his thoughts for his job. WAGASHI（Japanese sweets) is actually included to WASHOKU（traditional Japanese food) which is one of the World Intangible Cultural Heritage. Shofukudo is Fuse’s big fascination because we can feel closer to such an amazing Japanese culture. We got a lot of sweets as souvenir. Sweets always makes people happy, right? We appreciate the shopkeeper’s kindness. There are different types of sweets depends on seasons, so please check it out.